Homes must walk a fragile line between clutter and barren space. Finding equilibrium can mean all the difference between comfort and an overly busy home. Managing open space takes a perceptive eye when browsing furniture catalogues. To help with the procurement process we’ve put together a list of shabby chic pieces that’ll make the best use of open spaces without sacrificing comfort. Accompanied by a TV or not, this Bergere antique french style cabinet is perfect for filling the space. An excess of room doesn’t mean filling it with pieces that serve no function. Clutter occurs when the items around your house are not being used on a daily or even weekly basis. Conflating style and function, this antique cabinet is ideal for showcasing photos, cards, or storing books, remote controls, or any other pertinent object you don’t want lying around the house. This hand-carved piece brings home owners a blast from the past. Perhaps you just moved into your new home only to become the owner of a porch for the first time. Porches are lovely places to be outside without sacrificing the comforts of the home. Furnish your outdoor area with the right shabby chic furniture and you’ll never want to go back inside. The La Rochelle antique emits an antebellum feel while boasting its hand carved mahogany. 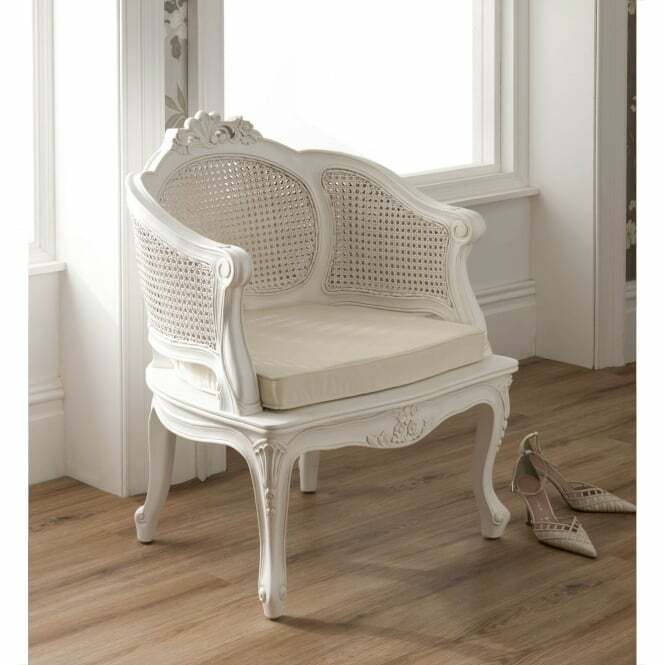 The rattan chair is ornate with smooth curves and an elegant design that gives off the perfect French boudoir feel. The chair’s aesthetic makes it perfect as a stand along piece or accompanied by another of its own style. This La Rochelle piece captures the intricate style displayed in the aforementioned piece but offers a bit more sitting room. This bench is exclusively hand crafted from the finest mahogany wood. 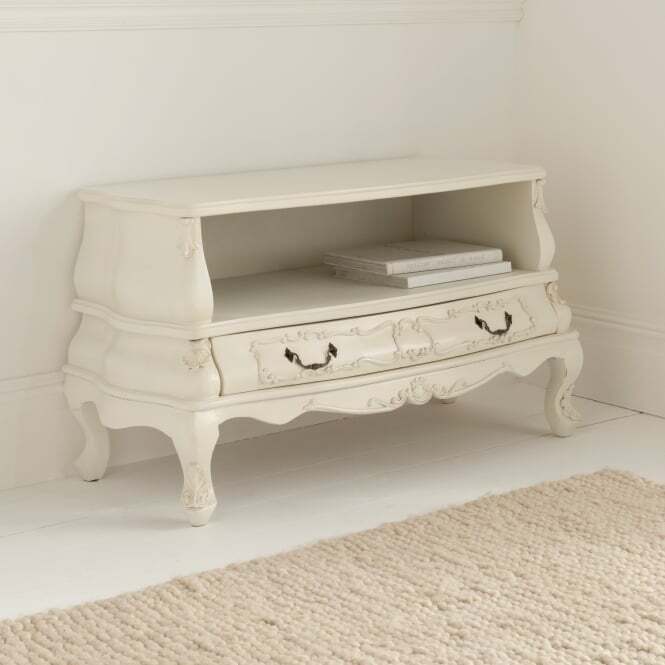 Sumptuous and antique, this is another shabby chic white finished piece that would be perfect for a shaded outdoor area or within the confines of your bedroom. 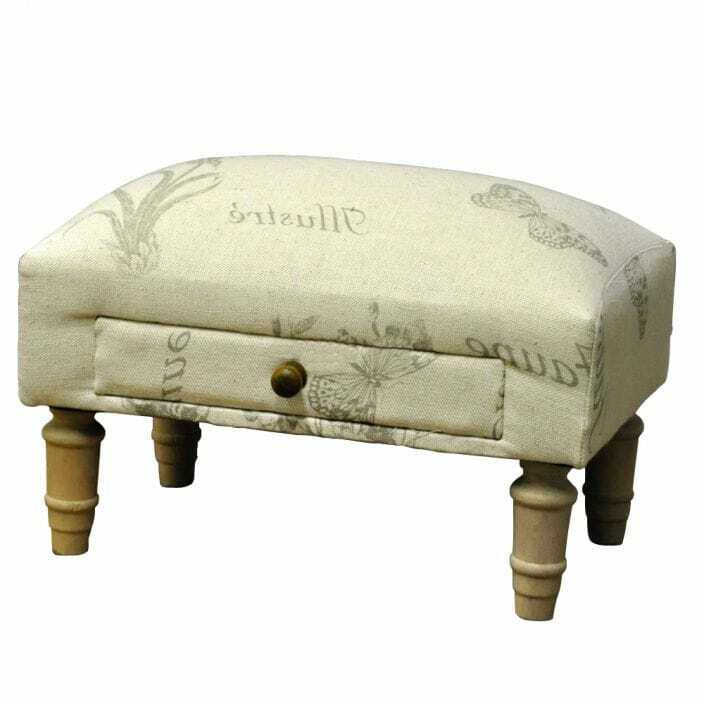 This footstool is perfect for spaces that just need a little something extra to feel complete. Without taking up much space and offering a comfy cushion to put your feet up this stressed antique is the ideal unassuming piece of furniture for any room.